President Nana Addo Dankwa Akufo-Addo launching free education at the higher levels of secondary schools. The President of the Republic, Nana Addo Dankwa Akufo-Addo, has, by Constitutional Instrument (C.I. 113), signified the official creation of the Bono East Region, and named Techiman as its capital. At a ceremony at Jubilee House, on Wednesday, 13th February, 2019, President Akufo-Addo noted that Bono East, an enclave which is ethnically diverse, representing about two-thirds of the entire land mass of the then Brong Ahafo Region, and whose predominant economic activity is agriculture, Bono East, with significant deposits of natural resources, is not as developed as it should be. That is why, according to the President, after receiving a petition from 14 chiefs from traditional areas within the municipalities and districts of the proposed Bono East Region for the creation of the region, he referred it to the Council of State for its advice. It will be recalled that, on 15th August, 2017, the Council advised that a Commission of Inquiry be established to determine whether or not there was a need and substantial demand for the creation of the proposed Bono East Region. The 9-member Brobbey Commission established that, indeed, there was a need and a substantial demand for the creation of the Region, and when the time came for the constitutional threshold to be met in the 27th December, 2018, referendum, 99.5%, out of the 85.82% of the electorate who turned out to vote, voted YES. President Akufo-Addo assured that "this Government, which facilitated the creation of this region, in compliance with the provisions of the Constitution, will help ensure the smooth take-off and development of Bono East." He continued, "The creation of the six new regions presents us with the opportunity to serve better the needs of people from these new regions through the effective and efficient reorganization and distribution of our public services and infrastructure." To this end, he indicated that he had, within one-week of the declaration of the results of the referendum, constituted a 7-member Government Committee to plan and oversee the rapid development of Bono East. 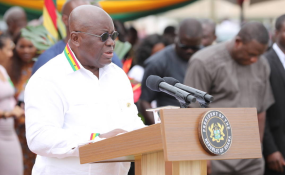 "In the President's 2019 Budget Statement, an amount of GH¢20 million has been allocated as seed capital for Bono East to help in the establishment of the needed infrastructure for the smooth take off of the Region, he added. President Akufo-Addo indicated that the current Regional Minister for Brong-Ahafo, Hon. Evans Opoku-Bobie, MP, has been appointed to act as caretaker Minister.